Introduction: Before the era of laparoscopic gastric bypass, many bariatric surgeons performed open undivided gastric bypasses(OUGB). The inherent issue with not dividing the stomach is that these patients are prone to staple line failure and gastrogastric fistula formation. Gastrogastric fistulas can lead to reflux, pain, marginal ulceration of the gastrojejunostomy, and weight regain. Any of these symptoms are an indication to repair these fistulas. 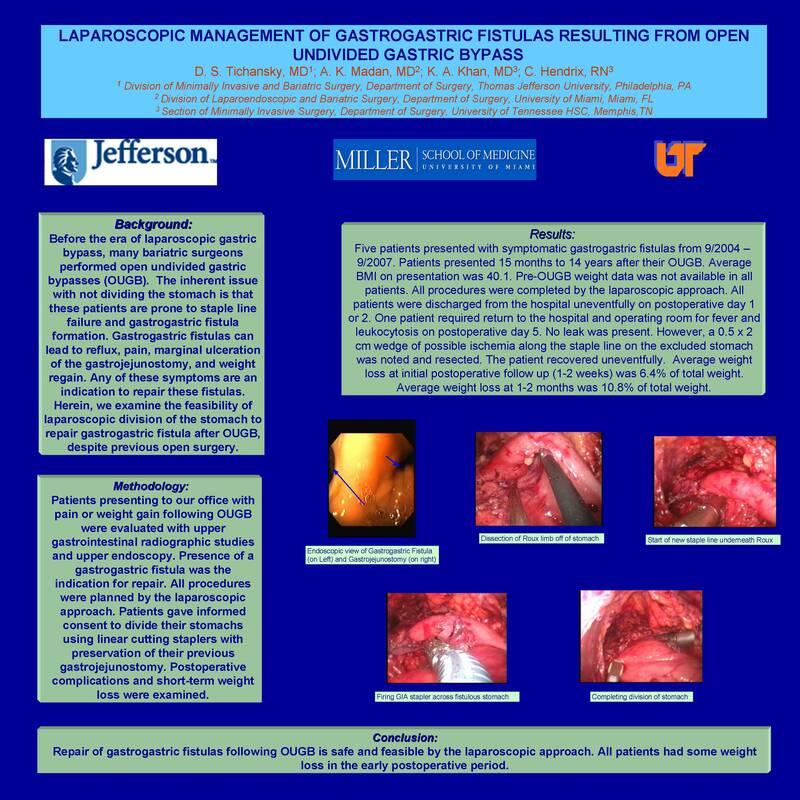 Herein, we examine the feasibility of laparoscopic division of the stomach to repair gastrogastric fistula after OUGB, despite previous open surgery. Methods: Patients presenting to our office with pain or weight gain following OUGB were evaluated with upper gastrointestinal radiographic studies and upper endoscopy. Presence of a gastrogastric fistula was the indication for repair. All procedures were planned by the laparoscopic approach. Patients gave informed consent to divide their stomachs using linear cutting staplers with preservation of their previous gastrojejunostomy. Postoperative complications and short-term weight loss were examined. Results: Five patients presented with symptomatic gastrogastric fistulas from 9/2004 – 9/2007. Patients presented 15 months to 14 years after their OUGB. Average BMI on presentation was 40.1. Pre-OUGB weight data was not available in all patients. All procedures were completed by the laparoscopic approach. All patients were discharged from the hospital uneventfully on postoperative day 1 or 2. One patient required return to the hospital and operating room for fever and leukocytosis on postoperative day 5. No leak was present. However, a 0.5 x 2 cm wedge of possible ischemia along the staple line on the excluded stomach was noted and resected. The patient recovered uneventfully. Average weight loss at initial postoperative follow up (1-2 weeks) was 6.4% of total weight. Average weight loss at 1-2 months was 10.8% of total weight. Conclusion: Repair of gastrogastric fistulas following OUGB is safe and feasible by the laparoscopic approach. All patients had some weight loss in the early postoperative period.